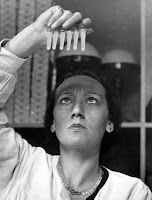 Google has just added images from the LIFE photo archive - both published and unpublished - to its image search, and there are some great photos of women scientists. "Biologist/author Rachel Carson sitting at microscope as she prepares to examine tissue on a petrie dish at her home." Taken September 24, 1962 by Alfred Eisenstaedt. Rachel Carson (1907-1964) was a marine biologist and writer, who is probably best known for her book Silent Spring , which revealed the detrimental effects of the widespread use of pesticides and weed killers on the environment. "Mathematics senior Judith Gorenstein working at blackboard at MIT." Taken February 11, 1956 by Gjon Mili. Judith Gorenstein Ronat was the president of the math club when this photo was taken. She is currently a psychiatrist in Israel. You can read more about her in this Technology Review article about the 50th anniversary of the Life photo shoot. "Dr. Chien-Shiung Wu, Professor of Physics at Columbia Univ". Taken in 1952 by Gjon Mili. Chien-Shiung Wu (1912-1997) emigrated from China to the US in 1936, received her doctorate from UC Berkeley in 1940 and contributed to the Manhattan Project by developing a process to produce bomb-grade uranium. She was the first woman instructor in the Princeton University physics department, and was a member of the Columbia physics faculty from 1944 to 1980. According to Wikipedia, her work contributed to the development of parity laws by Tsung-Dao Lee and Chen Ning Ynag, but she did not share their Nobel Prize, "a fact widely blamed on sexism by the selection committee." 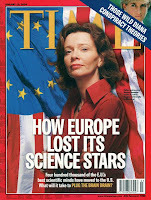 "TIME INTERNATIONAL cover 01-19-2004 featuring Italian astronomer Sandra Savaglio re migration of Europe's top intelligencia to the US"
Astrophysicist Sandra Savaglio is currently on the faculty of the Physics & Astronomy Department of Johns Hopkins University. "Chemist Marie Curie (1867-1934) in her laboratory." Taken in 1911. I don't think Marie Curie needs an introduction. This photo was presumably taken at the time she won her second Nobel Prize, "in recognition of her services to the advancement of chemistry by the discovery of the elements radium and polonium, by the isolation of radium and the study of the nature and compounds of this remarkable element." "Scientist, Marie P. Fish, discussing sound producing sea creatures at annual meeting of A.A.A.S., at University of California." Taken in December 1954 by Nat Farbman. Marie Poland Fish (1901-1989) was an oceanographer and marine biologist who studied underwater sound detection. Her research helped the US Navy devise methods for distingushing the sonar signals from schools of fish from the signals generated by submarines. Read her obituary in the NY Times. "Scientist looking over ampules of vaccine at the Pasteur Institute." Taken in 1938. The woman in this photo isn't identified. 1938 marked the 50th anniversary of the Institut Pasteur in Paris. that is a great post - and history lesson.